Fantasy, geometry , eccentricity and functionality are perhaps the key words to describe the collection of the emerging designer Julian Zigerli, who has shown his line at Armani Teatro in Milan. The beauty of the nature, revisited in a personal and geometric way, has guided the designer’s decisions. The lines and squaring run through the entire clothing, until they merge themselves with the body, which wears them to give at the garments an unique originality. Structured dresses and characterized by overlapping volumes, designed in collaboration with a French trio of graphic designers, named Golgotha. Without doubts, the collection is a riot of colors extremely bright, almost exaggerated, strong and of a great visual impact: stand out the intense yellow and the pink style. A colors’ game, prints and innovative materials, which give life to unique garments. 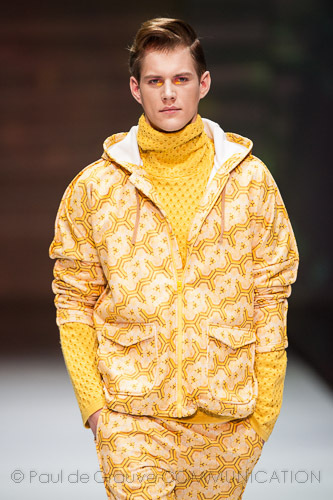 The particularity of the Swiss designer is the originality revisited with humorous: slippers become footwear, sweatshirts are blended with backpacks, underwear is matched to high-necked shirts. A cheerful and colorful collection that hit the public, but mostly, a fashion icon like Giorgio Armani, who is promoting Julian Zigerli.